September 2004, after three months spent at a mountain camp in the wilderness of Sequoia National Forest, California, we were ready to hit the open road. Our camp was situated at 7500 ft above the sea level and required a two hours drive to get to civilization. So we were eager to get some change. The coast was our destination. We rented a car at the Fresno International Airport. The word “International” was a bit of an exaggeration, as at the time of our visit they only had one international flight a day to somewhere in the middle of Mexico. Californians say that Fresno and surroundings is the most boring and uninspiring part of California. They are right. We left the area as soon as we made ourselves comfortable in the car. Well, as comfortable as possible for four quite big guys in the economy class car. After three hours we were approaching San Francisco. Nothing is better than driving to SF from Oakland crossing the Bay Bridge. It is a double deck suspension bridge and towards SF you drive on the top deck. The road leads directly to the downtown San Francisco and you have the feeling that you are going to land on the roofs of the buildings. Truly impressive. But we didn’t stop in the city. This trip was all about the coast. Just before the dusk we crossed another famous bridge, the Golden Gate, on our way north by the US Highway 101. We were heading towards the wild coast of northern California. After an hour or so we left behind all the suburban sprawl of Bay Area. The road changed from freeway to dual carriageway first and to a two lane road after. All the other cars disappeared and by 11pm we had the entire highway just for ourselves. We hadn’t booked any accommodation for that night, so we kept going and going and going. The road became curvy and narrow, crossing forests and mountains, including Redwood National Park famous because of its trees taller than sequoias. We crossed the park around 3am when it was wrapped in a dense fog. It was one of those moments when you remember the dark episodes of the X Files and start worrying. By the 4am we reached Brookings, one of the first settlements in Oregon and decided that enough is enough. We spent a few hours half sleeping in the parking lot of a local supermarket. This is the downside of a lack of planning when on a budget trip. Because we couldn’t really sleep the following day started early. At 6 am the local McDonalds opened. It had a really strange profile of customers, mostly retired folks, a lot of them wearing the WWII veteran pins or caps plus some youngsters talking about God. A bit heavy subject at 6am if you ask me. We were clearly a bunch of outsiders. The morning fog disappeared quickly and we could finally appreciate the coastal views. And what views they were. 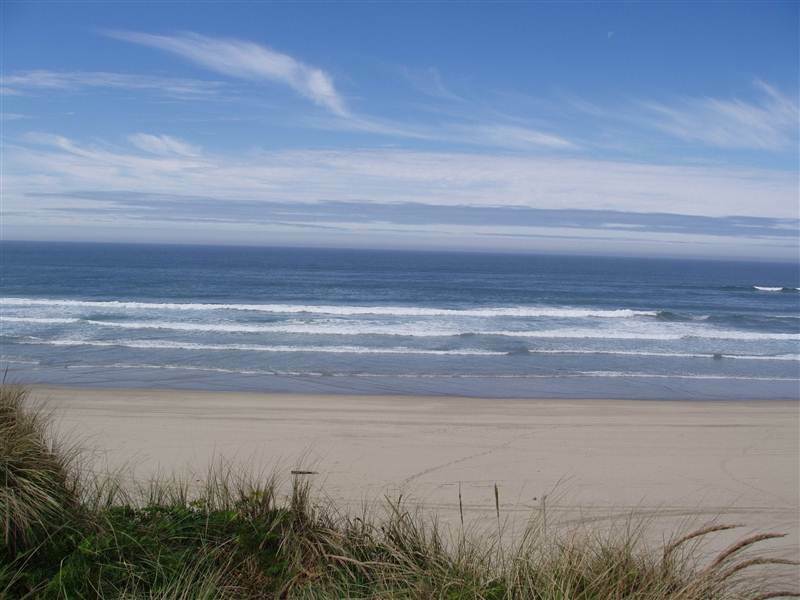 The Oregon coast is absolutely amazing. Small bays, cliffs, lighthouses, little fishing communities, forests, mountains, sand dunes and, in midweek September day, almost total lack of tourists. In a moment of craziness we decided to explore the wild beaches and coastal dunes. 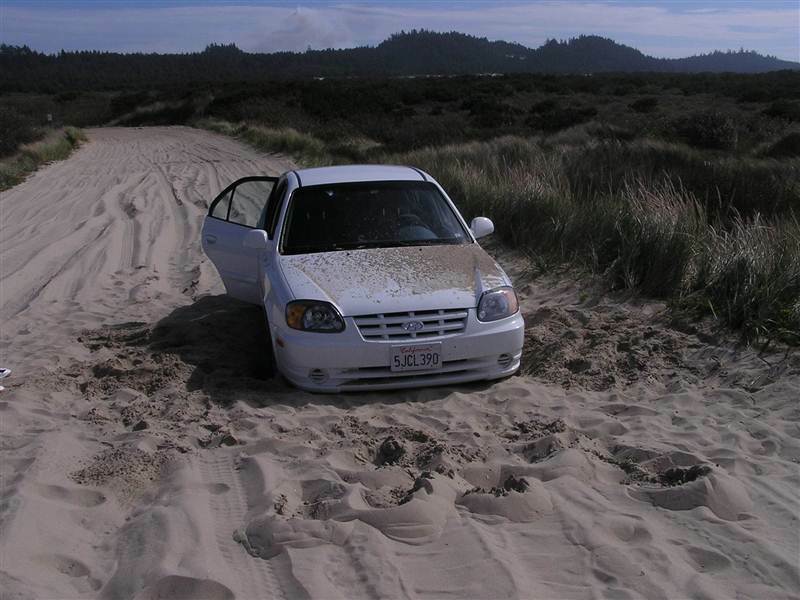 In some parts they are open for cars, but we realized very quickly, (after 100 yards or so) that an economy size saloon car, with two wheals drive, is not the best option for sand driving. Fortunately most locals drive SUVs or pick-up trucks which are able to tow a tank, so one of them helped us to get out of the sand. We decided to walk the remaining stretch until the beach. The beach was wide and wild, with trunks of trees, some of them could arrive all the way from Siberia. It is the kind of coast I like. Not like beaches of Florida or Mediterranean, crowded with tourists desperately trying to get tanned on small patch of sand. The same day part of the coastal road, (still US Hwy 101) was closed and we had to detour inland. Being a map fanatic, geographer and on-board navigator, I decided that I knew how to shorten this significant (100 miles or so) detour. It all started well but after a while we found ourselves stranded at a T-junction in the middle of Central Oregon Coast Range with signs pointing to place called Deadwood in all three directions It was too late to go back. We turned right (if I remember) and after some time, on a very steep and narrow road, with very poor surface and with no sign of civilization (apart signs mentioning shooting to strangers), we managed to get back to the main highway. It happened to be actually the highway which we were looking for. It seems I’m not so bad navigator after all. By the end of the day we crossed Columbia River, via impressive bridge in Astoria, and entered Washington State. This night we decided to spent in a luxurious wooden cabin at one of the campgrounds. We got there well after dark crossing another forest where another dark episode of the X-Files could be set. Our next day started from a visit to Aberdeen. One of us was a great Nirvana fan and Kurt Cobain was born and spent most of his life in this town. It is one of those small boring towns, one of thousands in America. Apparently Kurt hated it. There is no sign or shop or anything mentioning the most famous of the Aberdeen residents. A lady at the place called: “The best hot-dogs on the world” told us that the idea of erecting a plate in memory of Cobain was in the air, but the city officials said no. After a quick photo, next to the sign with the town name, we were on the move again. We drove around the Olympic Peninsula,right next to the wild beeches and temperate rain forests of the Olympic National Park. 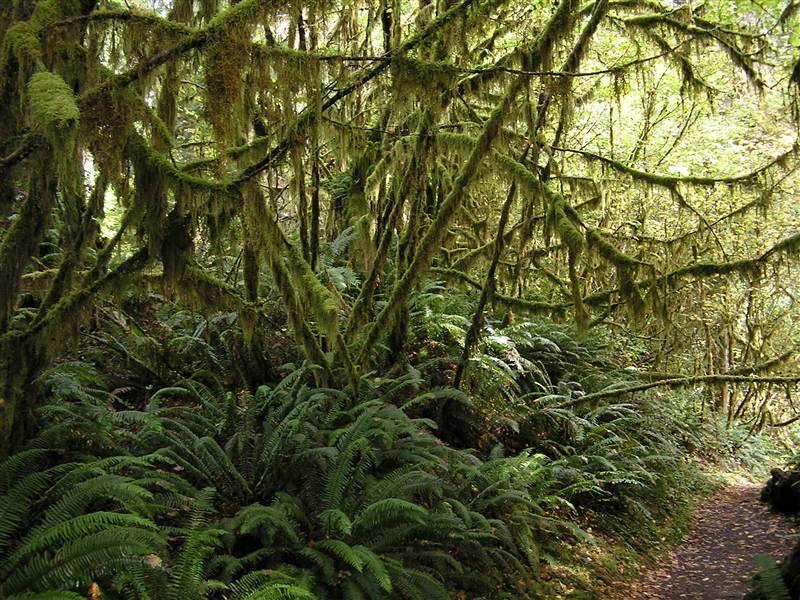 Temperate rain forests are unique to a few places around the world. Apart from the Pacific coast of Washington State and British Columbia they also exist in New Zealand and Southern Chile. They receive almost as much rain as the tropical rain forest but the temperatures are much lower. It is a real jungle where the massive trees are covered with other plants grooving on them. It is a one fantastic green mess. We went for a short educational trail in one of the park sections, which is a great experience but you have to be always ready for rain, it rains almost daily here. By night we were approaching Seattle. To save some time we took the ferry from Bremerton across the Puget Sound to downtown Seattle. It cost just few dollars and save more than an hour or two of driving It was dark again by the time we reached our destination. Fortunately the view of Seattle’s skyscrapers from the ferry is equally stunning by either night or day. In Seattle we stayed two nights in Green Tortoise Hostel. It is located right in the downtown and cost 20 dollars or so for a bed in one of the dormitory rooms. It is a great city, full of cafes (that’s where first Starbucks opened), cheap eateries and nice people. 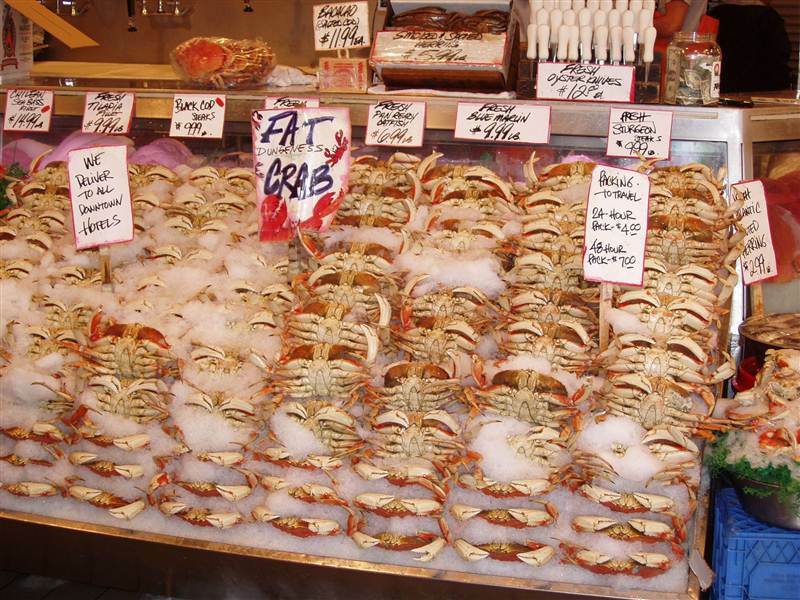 One of the best places to start your visit is Pike Place Market where you can buy almost everything. But it is more about the atmosphere rather than about the products. Especially fishmongers, shouting to the potential buyers and throwing fish between themselves, are a great sight. Another great spot is Space Needle, a tower offering great views of the city, Olympic Mountains across Puget Sound, and (on clear days) magnificent Mount Rainer with eternal snows on top. Seattle has a quite good public transport network. The main hub is the bus tunnel witch runs right underneath the downtown. It is a bit like metro but you see trolleybuses arriving at the stations instead of trains. After leaving the tunnel they switch to diesel and travel to many suburbs of Seattle including the University of Washington campus. I recommend this place for cheap good food, nice atmosphere and good bookshops. The next stop on our journey was Portland. It is three hours south of Seattle at the confluence of Columbia and Willamette Rivers. It is much smaller than Seattle but has the same progressive feel. Both cities have good public transport, mainly because the Pacific North West residents are much more environmentally conscious than populations of the other parts of USA. We had just one evening in Portland so we decided to visit some of the many local brewpubs. Apparently Portland is the city where brewpubs and micro breweries first became popular. At least in the US. To find them you can go to one of the many drinking establishments in the Northwest District, along the 21st and 23rd Avenues. Some of the beers we had were really strong and after a few small bottles we went back to our hostel jaywalking. After Portland we drove straight back south to San Francisco. It was the starting point of the last part of our coastal trip, the Big Sur. Some say it is the best scenic road in the world. In San Francisco we slept in Green Tortoise Hostel located right on the Broadway between clubs, bars and restaurants. It was Saturday night, so we didn’t sleep that much. This hostel, similarly to his brother in Seattle, was a bit crappy, noisy and full of cool dudes. Generally a great option for someone looking for fun but not really good for sleep. The next morning we drove out of SF. The beginning wasn’t too promising, one of those not so good and very busy highways (a lot of people go to the coast on Sunday). The first interesting spot was Monterey. It is an exclusive place full of expensive mansions, gardens, golf courses and iconic cypresses. But the real fun started from there. California Highway 1 makes its winding way squeezed between the Santa Lucia Range and the Pacific on its way towards Los Angeles. It is an amazing feat of engineering. This road crosses deep river valleys and runs on a very narrow strip of land right next to the high cliffs. Views are absolutely stunning. But you better use the view points (fortunately there are lots of them) because the road is very curvy and driving requires full of your attention. The weather was perfect during our trip but this part of coast is frequently covered by fog. It might make driving really dangerous. It is a very empty coast. It is in fact one of the emptiest coast in the lower 48 states. On the way there are only few exclusive communities, art colonies or hidden private ranches. 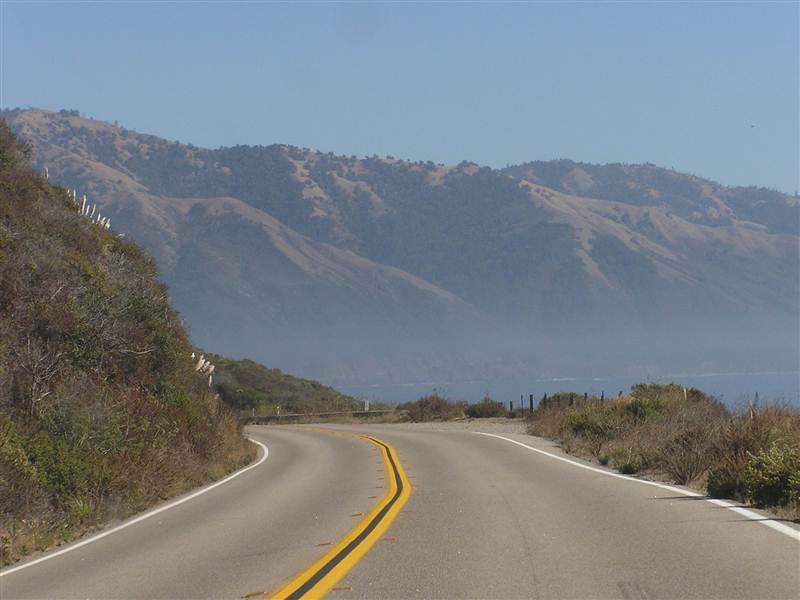 Hwy 1 is the most scenic and wild between Carmen-by-the-Sea (an exclusive small town where Clint Eastwood was a mayor for a while) and Morro Bay. No condos, no shopping malls, no crowded beach resorts or fast food joints, not even a single traffic light. True 121 miles of driver’s heaven. After Morro Bay things get back to normal, little towns appear, and you can buy some food or gas. Closer to LA things get very hectic. California Hwy 1 joins US 101 and then becomes one of the many LA freeway. That’s where the real madness began and our trip ended in Santa Monica. Santa Monica is one of the nicest parts of the greater Los Angeles. 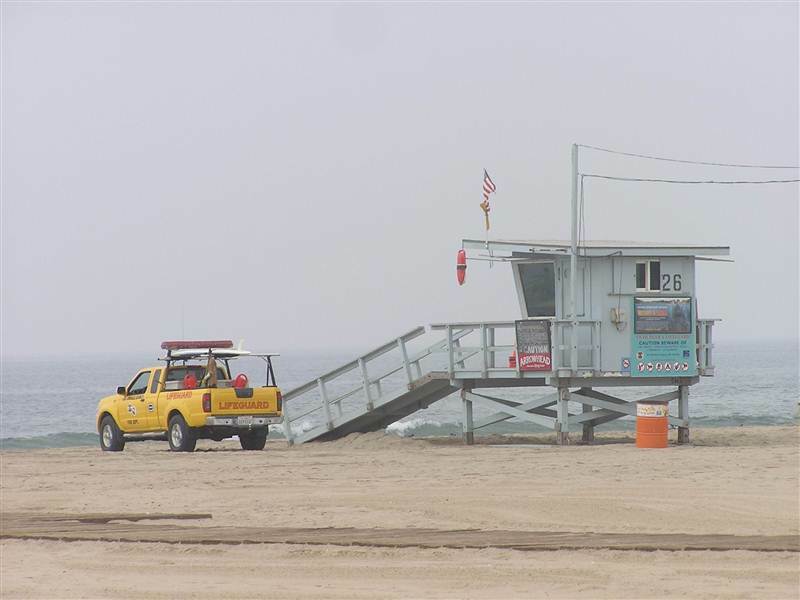 It has a nice wide beach with biking and walking trails continuing all the way to the neighboring Venice Beach. Both communities are practically joined and offer the same great SoCal lifstyle. Nice weather, surfing, good beach, good food and great people watching opportunities. It was a great place to spend the last night before flying back to grey and rainy Katowice. 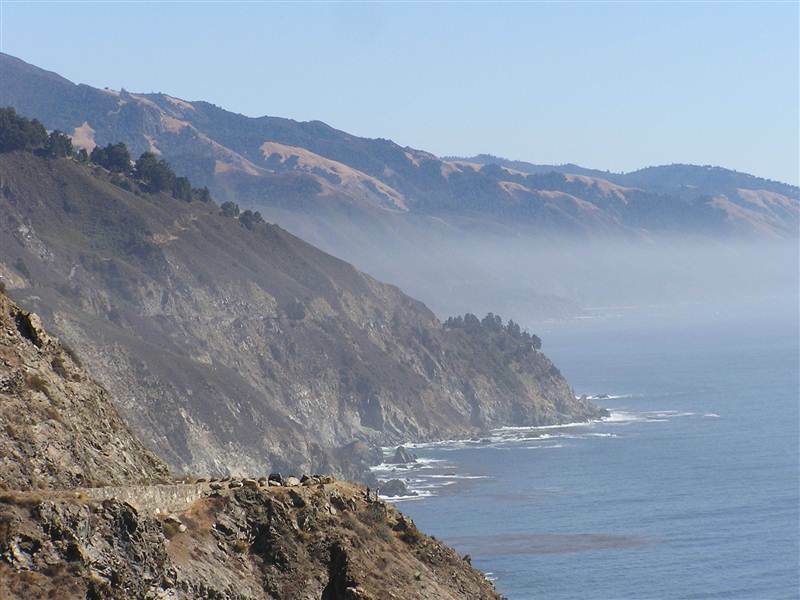 This entry was posted in Uncategorized and tagged america, Big Sur, California, California Hwy 1, coast, Olympic National Park, Oregon, pacific, road trip, San Francisco, Seattle, travel, usa, Washington, west on April 20, 2011 by admin.